You will need a 1.2-litre capacity loaf tin (about 23 x 13 x 5.5cm). I used my 2lb loaf tin from John Lewis which has ‘loaf’ embossed on the side (although sadly this didn’t show up on the baked loaf). As I have mentionned above I decided to prove my bread overnight but if you have a warm kitchen you can leave it to prove in you can make a loaf in approximately 3 hours. 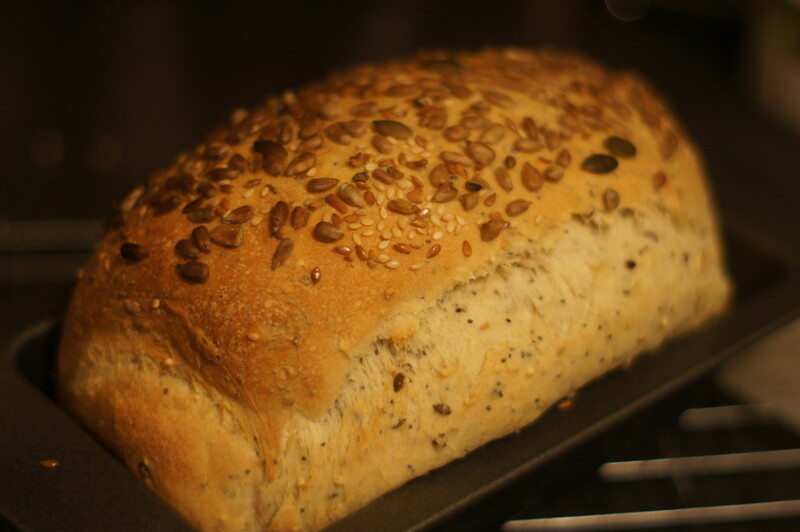 My only issue is that most of the seeds have popped off after baking – despite me pressing them down into the loaf before baking. 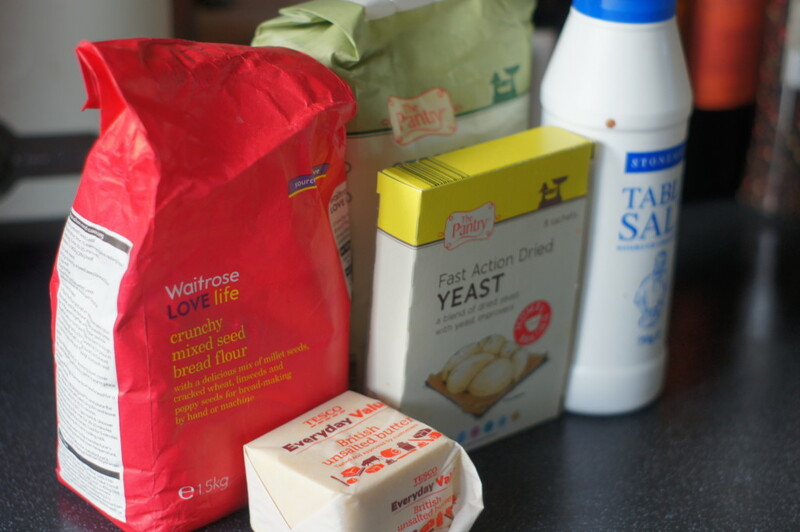 1) Mix your choice of brown or seeded bread flour with the white bread flour, the yeast and salt in a large mixing bowl (make sure you keep the salt and yeast on separate sides). Put in the butter and rub it into the flour. Stir in the seeds (if using). 2) Make a dip in the centre of the flour and pour in almost 300ml hand warm (cool rather than hot) water, with a round-bladed knife. 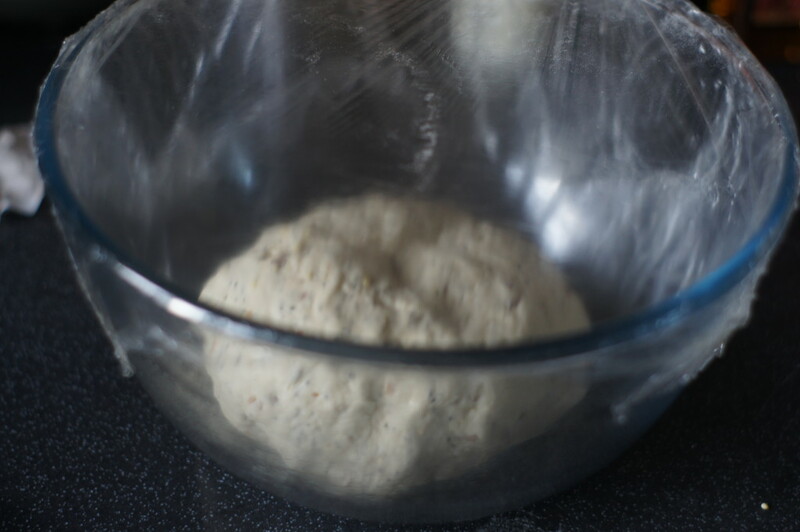 Then mix in enough of the remaining water (bit by bit) to gather up any dry bits in the bottom of the bowl and until the mixture comes together as a soft, not too sticky, dough (you can add some more water if needed). Gather it into a ball with your hands. 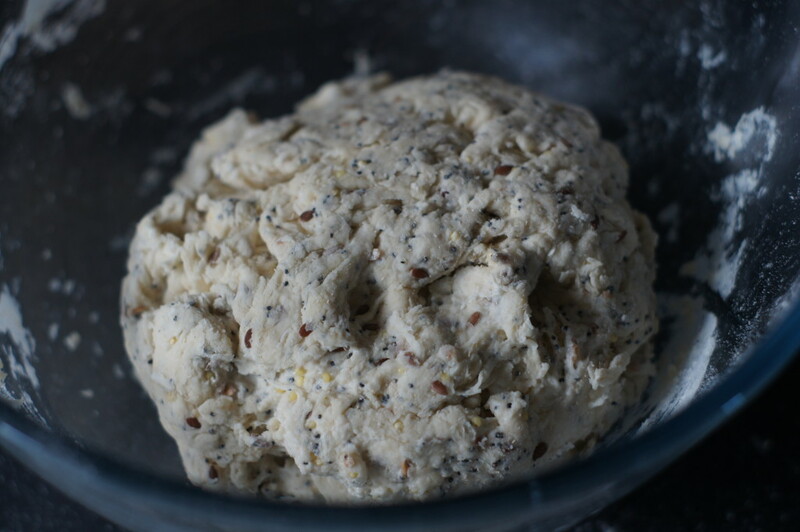 3) Put the dough on to a very lightly floured surface and knead for 8-10 minutes until it feels smooth and elastic (only add extra flour if necessary to prevent the dough sticking). 4) Decide how you are going to prove your loaf. If in a hurry, place the ball of dough on a lightly floured work surface, cover with an upturned, clean, large glass bowl and leave for 45 minutes to 1 hour or until doubled in size and feels light and springy. Timing will depend on the warmth of the room. Alternatively, like me you can place it in a lightly oiled bowl, cover with oiled cling film and leave it to prove overnight in a fridge. 6) Now shape to make a tin loaf. Grease a 1.2-litre capacity loaf tin (about 23 x 13 x 5.5cm) and line the base with baking parchment. Using your knuckles, flatten the dough into a rectangle about 25 x 19cm. Fold both shorter ends into the centre like an envelope, make a ¼ turn, then flatten again into the same size and roll up very tightly, starting from one of the short ends. 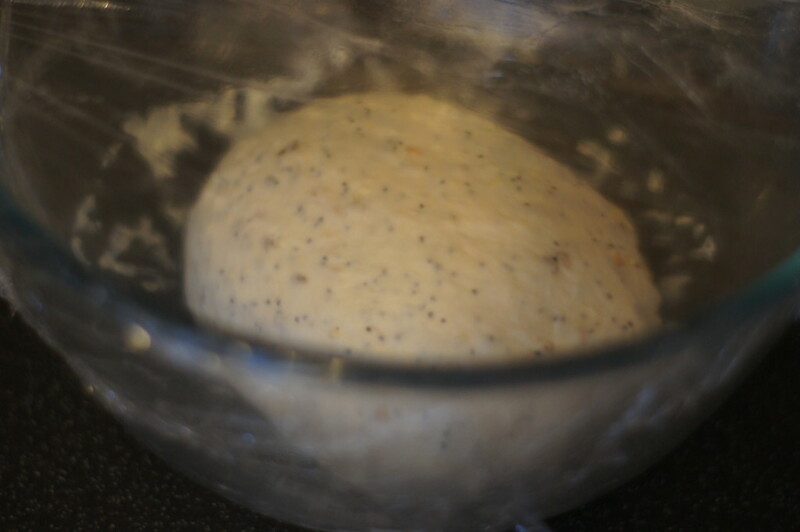 7) Roll the top of the dough in extra seeds and place in the tin with the join underneath, pressing the seeds gently into the dough. Cover with a clean tea towel. Leave for 40-45 mins, or until risen about 5cm above the top of the tin. 8) Put a roasting tin in the bottom of the oven 20 minutes before ready to bake and heat oven to 230C/210C Fan/Gas 8. Put the risen bread in the oven, carefully pour about 250ml cold water into the roasting tin (this will hiss and create a burst of steam to give you a crisp crust), then lower the heat to 220C/200C Fan/Gas 7. Bake for about 30 mins or until golden, covering with foil for the last 5 mins if starting to brown too quickly. Leave in the tin for 2-3 minutes, then remove and cool on a wire rack. If you tap the underneath of the baked loaf if should be firm and sound hollow.